One of my absolute favorite sets from GinaK is the Love you to Pieces set, which is the first set that Gina created for the Stamps for a Cause collection. $8.00 (yes, you read that right!) from every set goes directly to Autism Speaks. It's an amazing stamp set with an amazing donation to an amazing cause! My 11 year old son is autistic and I was so thrilled when I pitched this idea to Gina way back in January of 2007 and that she jumped on board with it. That's one of the many things that I love about Gina. She has such a big heart! I used the emboss resist technique for this card. I stamped the puzzle cluster image all over a piece of ivory cardstock with dark pink ink. I then stamped the large heart image three times across the cardstock with Versamark ink and dusted it with clear embossing powder. After I heated the powder and let it cool, I sponged over it with a burgandy ink. 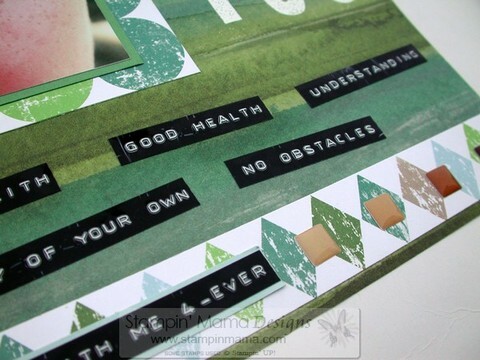 Doing this allows the embossed finish to resist the ink and shows the images beneath. It's eye popping....I LOVE this technique. The entire GinaK Designs team would like to invite you to the virtual Release party we'll be having tonight (Thursday, August 5th) on StampTV. It will be a bit different than our usual release party, but we'll still have challenges, contest questions, and designer samples that you won't want to miss out on! See you there for all the fun! I felt a need to scrapbook today. I've had a thought growing in my mind for a little over a week and needed to get it out. As most of you know, my son,Zach, is autistic. I stay in the loop of what's going on in the world when it comes to autism. I believe in not only advocating for my own son, but also for others just like him. One of my passions is to make the world aware. After reading stories in the past week of what families like mine are going through, along with living in our own world of autism, it made me want to write an open letter to the world. That's what this whole page is about. Lately, I've been playing with my paints. They got put aside for a few months, but I've brought them back out since they work so well with my recent obsession with chipboard. Now that I've been playing in my paint box, I want to take out some of those HUGE canvases I have hiding in my closet that are begging for paint. I used a piece of Bazzill textured cardstock for my base page. I found a piece of green patterned cardstock (from the Old World Stack by Die Cuts with a View) that brought out some of the colors in my photo and used a large bowl to trace a partial circle on it. I cut that out and mounted it on my cardstock. But....before I did that, I used some white Gesso paint and a stiff brush to paint around the edges of the blue cardstock and the green cardstock. I wanted to bring out some of the brown from the river bed, so I used a scrap of Basic Grey paper I had (from the Motifica collection) to partially mat my photo (which was also painted around the edges with Gesso paint). Who says you have to fully mat a photo? 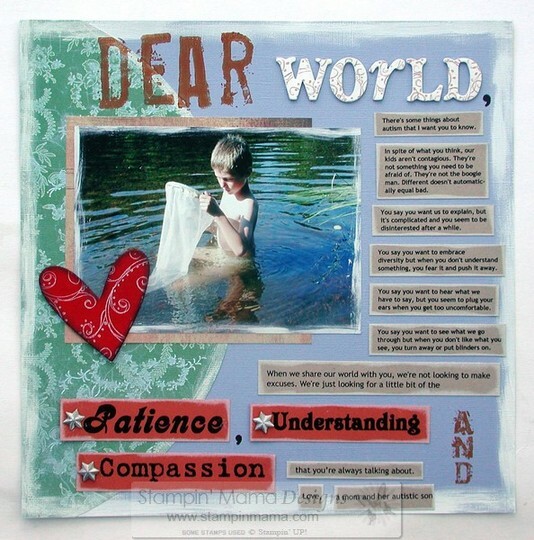 The words, "Dear" and "AND," at the top and bottom corners of the page were done by sponging brown acrylic paint onto some large alphabet stamps (Well Worn Alphabet set from Stampin' Up!) and stamping them onto the page. Those weren't the only stamps I used on this page. 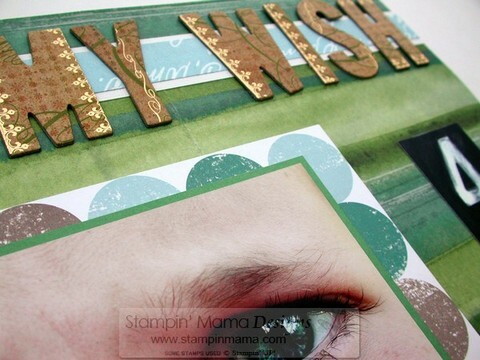 I also customized my chipboard embellishments with stamps! I started out by painting my chipboard with acrylic paint (white paint for the word, "world," and red paint for the large heart). 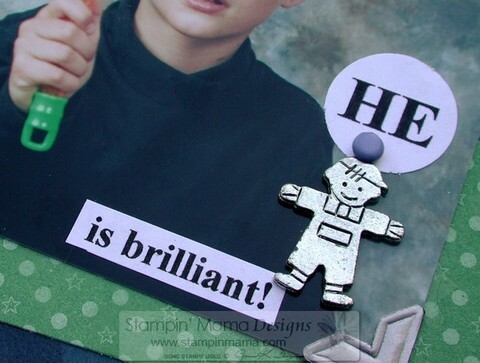 I then stamped on top of the chipboard (after it dried, of course) with the smaller flourish image from the Doodle This stamp set (from Stampin' UP). 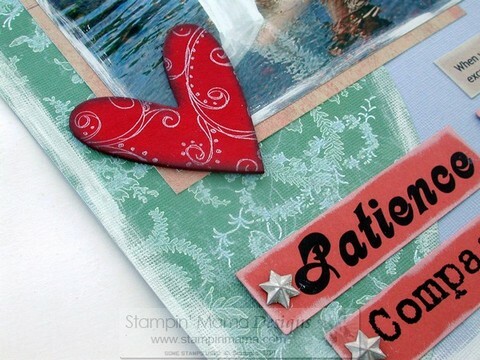 I stamped with Close to Cocoa ink on my letter chipboard pieces and I used Whisper White craft ink on top of the red heart. I also sponged around the heart edges with Chocolate Chip ink. My journaling was done on the computer and I printed it on Kraft cardstock and Ruby Red cardstock (for the larger and more descriptive words). I cut my journaling apart in blocks and then swiped around the edges with my Whisper White craft pad. The two large black commas on my page were done by hand with a Slick Writer. I used a large pewter finish star brad (from Creative Impressions) on each of my Ruby Red words. Before I put the brads in the cardstock, though, I lightly touched them to my Whisper White craft pad and then dried the ink with my embossing gun. After I completed my page, I realized what a happy surprise I had staring back at me. My journaling is a letter to the world and the large partial green patterned cardstock circle that I had created at the beginning of my page looked like a view of the earth from against the blue sky. I totally had NOT planned that. I had picked the cardstock out because the colors drew from the colors in my photo. I chose the circular pattern so that it would soften things up, knowing that I was going to use a lot of straight angles with my journaling. I hadn't planned it, but it was obviously meant to be. There's some things about autism that I want you to know. not something you need to be afraid of. They're not the boogie man. Different doesn't automatically equal bad. You say you want us to explain, but it's complicated and you seem to be disinterested after a while. You say you want to embrace diversity but when you don't understand something, you fear it and push it away. You say you want to hear what we have to say, but you seem to plug your ears when you get too uncomfortable. You say you want to see what we go through but when you don't like what you see, you turn away or put blinders on. When we share our world with you, we're not looking to make excuses. We're just looking for a little bit of the Patience, Understanding and Compassion that you’re always talking about. Did you know that April is Autism Awareness Month? 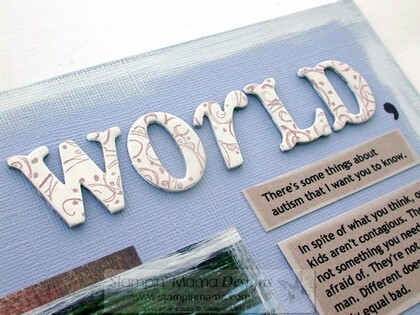 And did you also know that April 2nd is also World Autism Awareness Day. This was news to me. I knew the month of April was Autism Awareness Day, but I didn't know there was a day set aside for world awareness. How fitting, then, that I created this page today and found out only AFTER I had created it what today really was. When I realize what today was, I decided to share this page with you all. I just couldn't keep it to myself, considering what this day stood for. Or even this month, for that matter. If you've been reading my blog for a good amount of time, you know that my son, Zach, is autistic. You've probably also figured out that one of my passions is Autism Awareness. Every time I look at the numbers, it blows my mind how short the world falls when it comes to truly understanding, or even being aware, of what autism really is. The number that REALLY gets me to scratching my head is the low, LOW amount of funding that goes into research! ONLY .3% of all the funds allocated to research for disorders and diseases goes towards autism. Not even one whole percent! Yet, 70 children in the US are being diagnosed daily! 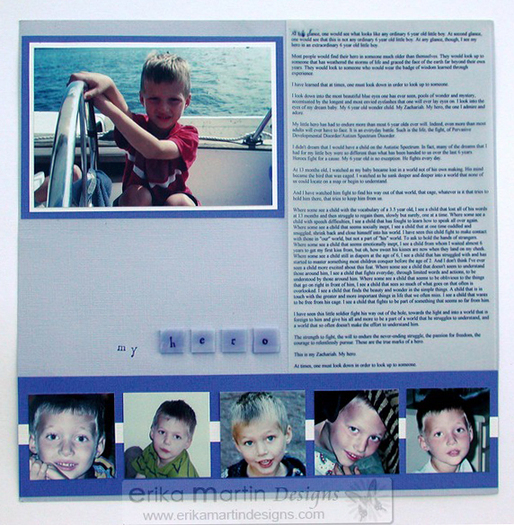 It was just a year ago yesterday that GinaK Designs released the Love you to Pieces stamp set in honor of my son and to benefit autism research. This set is near and dear to my heart. It was the set I reached for when I pulled out these pictures of Zach and I. I knew I had to use it on this page. I started off with a Not Quite Navy cardstock base and stamped one of the puzzle pieces around the cardstock with Versamark ink and then embossed the images with clear embossing powder. I also used the same puzzle piece and stamped the image on a piece of Wild Wasabi patterned paper and embossed it with clear powder. I cut it out and mounted it on my page with pop-dots. You can't see it in the picture above, but I also embossed clear smaller puzzle pieces (from the background stamp in the Love you to Pieces set) along the strip of patterned paper at the bottom of the page. When you look at the page "in person," you can see shiny puzzle pieces along the paper. I love all kind of fonts and combining different letter embellishments for a fun look, so that's what I did with my title on this page. I covered a chipboard letter (I punched out the inside to use on a different project), I used tile pieces, large letter brads, some mini bottle caps and some pre-decorated chipboard letters. I had used the "W" from this pack of chipboard, so I had to get a little creative to be able to spell the word, "aware." I turned the "M" upside to create a "W." I made my large letter brads match my big green chipboard "M" by punching out some patterned paper circles and securing the brads onto them and mounting them with pop-dots. A few months ago, I found some really adorable little boy charms at the dollar store. I picked up a couple packs because I wanted to use some on another scrapbook project, but also because I knew that I would definitely find a use for them on other pages and projects. 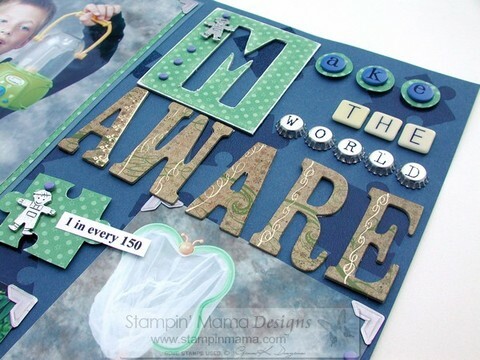 I used a bunch of mini blue brads around the page to create a cohesive embellishment theme. 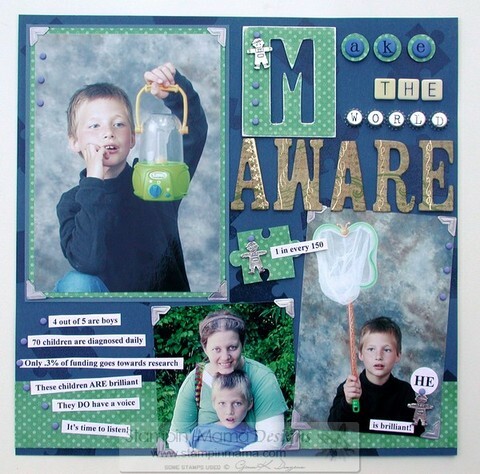 The journaling from this page incorporates some staggering autism statistics. * It's time to listen! And then I added a special bit of journaling on one of Zach's pictures: HE is brilliant! So many people don't realize that these kids ARE brilliant. They have bright and sharp minds with so much to share with us if we'd only take the time to understand, listen and try to bridge the gap between their worlds and ours. I can't promise that it's an easy task. Trust me. It's not. I may be the perfect parent for Zach, but I'm not a perfect parent. But believe me when I tell you that it's so worth it to try t mesh those two worlds together. You never know what you're going to learn.....but you'll learn something. I promise you that. "Love Rocks" artwork.....just one day left! 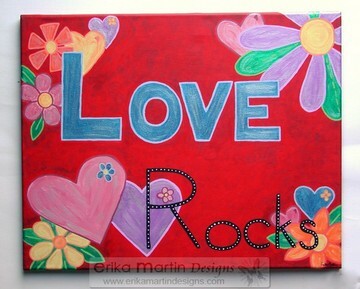 Just wanted to put out a quick reminder that the auction for my "Love Rocks" artwork on Ebay will be ending tomorrow. This auction benefits Autism Support Daily ...a great organization helping families with autistic children and adults to get the help they need NOW. This is your chance for a great piece of colorful artwork to brighten up your home or a child's room, plus you'll be helping out an amazing cause! In about a week, a new piece of artwork will be on Ebay and I'm hoping that the new one will be by Zach, my 9 year old son, who is autistic. He's amazingly talented and loves to paint. Thanks for looking and for bidding! Thank you to everyone that took part in the HUGE Groovy Give-Away post that I've had up since last Thursday! I'm overwhelmed at the outpouring of birthday wishes for Zach, as well as the comment you've all left for me. The encouragement and support has been amazing! I know I've said this before, but it bears repeating: The love and support in the paper crafting world is second to NONE! THANK YOU! This post got a total of 488 comments! WOW! I'm stunned! I wish I had 488 prizes to give out.....but alas, I only have 5 prizes. So with that.......here's the 5 winners! Happy birthday to Zach... I love your blog... very inspirational! Thanks for spreading the word about autism! My son has Asperger Syndrome which is on the autism spectrum. I sure hope Zach had a wonderful birthday! Happy Birthday Zach and keep up the great work to raise awareness of Autism! Erica thank you for this graceful gift in honor of your handsome boy, for a great cause. Do you have some specific informative sites about Autism? I know we can google and get that, but then it becomes overwhelming. Thanks. Happy Birthday Zach! I have three boys (and two girls-all grown up) so I know how important birthdays are to handsome young men like yourself! Thank you Erika, for all your work in autism awareness. Bless you and bless your work! I don't personally know anyone with autism, but was privledged a number of years ago to hear the awesome Temple Grandin (sp?) speak. There is much that can be done, and awareness is the first step! Thanks for sharing your gifts! I'll be emailing all of you girls with specifics so be on the lookout in your inboxes! As for Marcia's question about a list of autism resources and sites, you can check out the page that MockUTV has put up on their site for Zach's story. There is a list of links that I compiled in the left hand side bar that has all sorts of great web resources for getting started on learning about autism. I felt the scrapbooking itch again today and took out a picture that my dear friend, Jen, took while she was here last May. This is one of my favorite pictures of Zach and I. I can't believe that I hadn't scrapbooked this picture until today! Someone recently emailed me and asked what size scrapbook pages I work on. I am a big sucker for 12 x 12" pages. 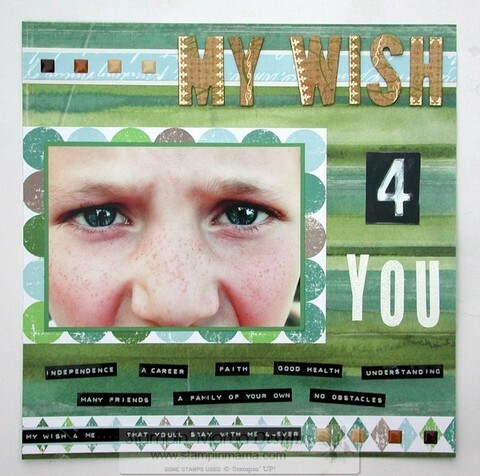 I started my first scrapbook in an 8 1/2 x 11" ring album 11 years ago and when I was done with it, I decided that my creative side was just SCREAMING for a larger page to work on. I know that some people swear by 8 1/2 x 11" pages, but I felt so confined by that size and have been working on 12 x 12" pages ever since. I like to spread myself out on my pages and this larger size worked perfectly for me. I've done a few smaller albums as gifts and theme albums, but other than, I'm a die-hard 12 x 12" kind of girl. Speaking of larger sizes, I'm also a big fan of working with 5 x7" photos. I love that this size brings so much attention to a special photo. A 12 x 12" page holds this size very nicely, while still allowing plenty of space to fit a couple extra pictures on as supporting photos. The picture that you see on this page, as well as the one on the My Wish page that I posted this past Sunday, is a 5 x 7" photo. The larger size photo also works nicely if you choose to only showcase one photo on a page and go heavier on the journaling. The 5 x 7" size doesn't get lost on a big page and there's plenty of room for more journaling or getting really creative with your art. When I started with this page, I had a lot that I wanted to add to it, but I wanted to make it a simple design and fairly quick to create. I'm seeing, more and more, what a treasure trove my GINORMOUS collection of patterned papers and cardstocks is. Even though this page was fairly quick and easy to put together and isn't overwhelmed with embellishments and only has photo, it still looks like there was a lot of time put into it. 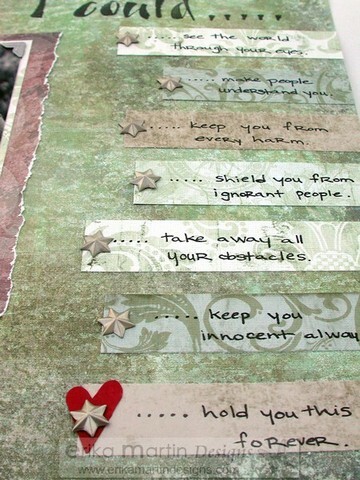 I think a large part of that is the use of the patterned cardstocks that I used. I stamped the title with a Wordsworth alphabet set and black ink. The journaling was all done by hand using a black journaling marker. This page idea actually came from a feeling of anger. When I look at the finished page, though, I still feel some of that, but I also feel a tremendous amount of love towards my little man. I feel resolve and strength to protect someone I love so much that doesn't understand that fight that needs to be made on his behalf. I should probably explain the anger that I felt that spurred me on to create this page. Just a couple days ago, I was reading an article online about a teenage autistic boy who was taken from his home by the government and I felt myself reeling inside from rage. You can read the article by clicking ---> HERE. It's a gut-wrenching story and it made me hold on to my son even tighter these last few days, cuddling with him longer and giving him some extra kisses. This story made me think of all the things that I wish that I could do for my son. Reading stories like that, KNOWING that another family is hurting and in pain, makes me want to take my little family and go far, far away where no one can hurt us, where my son can catch bugs all day and where we can live a life that is safe and nurturing. While that is nice to think about and something we probably COULD do if we really, really wanted to, I choose to stay and fight for my son and be a voice for other children that can't fight for themselves or don't have anyone to fight for them. When I looked at this picture, it made me think of the family in CA that is without their son......a mom that is unable to hold her son tight in her arms like I am. It makes my eyes tear up. I hurt for those parents, for that brother and for the son. This is where my journaling came from. ...see the world through your eyes. ...keep you from every harm. ...shield you from ignorant people. ...take away all your obstacles. ...hold you this close forever. I used star brads on each of my journaling tabs and for the last tab, I put the star brad through a red punched out heart. I really do wish that I could keep him self and sheltered forever. It's a mother's heart-call for all of her children. But while my instinct makes me hold him close to me while I can, my instinct also make the mother-bear in me come out and bare my claws for him, and all children, to stay safe in loving homes with loving parents that want the best for their children and will do anything to provide that safe environment for them. I have been amazed and humbled over the past week by the comments and emails that you have all sent me. I am SHOCKED that I've gotten almost 500 comments on the give-away post. I've also been touched that so many of you are linking to me in your blogs and on forums to spread the word for autism awareness. I've been excited to see my Ebay auction for autism funds go up and know that some of you have spread the word for that, too! Please know that this means the world to me! It can be a scary thing to put yourself out there for so many to see....especially in such a deep and intimate way. 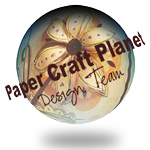 I've found nothing but love, compassion, understanding and kindness in the papercrafting world. I want to thank you all for that. Your response to my sharing has created a fire for me to share more, as I want people to understand what living with autism is like.....I believe that sharing contributes to knowledge, compassion and understanding. Those are things that make the world a better place for ALL of our children, autistic or not. Hug and hold your kids just a little bit tighter.....or those you love most if you don't have kids. Protect and nurture them while they're still in your arms. Time goes by so quickly. Do what you can while you have that time. Don't let it get away from you. I posted this page when I first started my blog (that seems like AGES ago, though it was exactly 18 months ago). I don't know how many of you have had the chance to see it, considering that it's buried in the archives. Since I've been on the subject of autism awareness recently here in my blog, I wanted to share with you this page that I did back in February of 2005. It's amazing to think that this was what we were going through just 3 years ago. Zach has come SO far in these 3 years and many of the barriers and obstacles he faced just 3 years ago are no longer there. Sure, there's still a vocabulary issue, along with speech delays that he's still catching up on, but he is talking a mile a minute and forever asking questions of anyone he meets. He's been out of diapers for 2 years now. This little man is a total social butterfly in some aspects that we never thought he would be, but there are still times that he draws into his own world and it's hard to pull him out. At one time, this little guy of mine seemed content to simply allow the people around him to pass by him, but he now draws everyone in. He wants to meet everyone, talk to everyone, drill everyone. Much of this progress, I attribute to a big God, a lot of prayer and angels in the form of the interventionists we've had working with Zach since he was 18 months of age. I am so thankful that we caught this early and were able to start with his intervention at an early age. It really proves to me that early intervention can do SO much. But we need to take the steps to look past ourselves and those feelings of inadequacy and pride to look into the world of our little ones and get the help they need....without worrying about what others will think or how we think about ourselves. Guilt and regret can hold us back from the possibilities that abound around us. We only have to let go of those things that bind us and drag us down and open ourselves up to the wonderful things that CAN happen if we allow them to. I've included the journaling from this page below the picture, as it's in smaller print and hard to read in the picture. At first glance, one would see what looks like any ordinary 6 year old little boy. At second glance, one would see that this is not any ordinary 6 year old little boy. At every glance, though, I see my hero in an extraordinary 6 year old little boy. Most people would find their hero in someone much older than themselves. They would look up to someone that has weathered the storms of life and graced the face of the earth far beyond their own years. They would look to someone who would wear the badge of wisdom learned through experience. I have learned that at times, one must look down in order to look up to someone. I look down into the most beautiful blue eyes one has ever seen, pools of wonder and mystery, accentuated by the longest and most envied eyelashes that one will ever lay eyes on. I look into the eyes of my dream baby. My 6 year old wonder child. My Zachariah. My hero, the one I admire and adore. My little hero has had to endure more than most 6 year olds ever will. Indeed, even more than most adults will ever have to face. It is an everyday battle. Such is the life, the fight, of Pervasive Developmental Disorder/Autism Spectrum Disorder. I didn't dream that I would have a child on the Austistic Spectrum. In fact, many of the dreams that I had for my little boy were so different than what has been handed to us over the last 6 years. Heroes fight for a cause. My 6 year old is no exception. He fights every day. At 13 months old, I watched as my baby became lost in a world not of his own making. His mind became the bird that was caged. I watched as he sank deeper and deeper into a world that none of us could locate on a map or begin to understand. And I have watched him fight to find his way out of that world, that cage, whatever is it that tries to hold him there, that tries to keep him from us. Where some see a child with the vocabulary of a 3.5 year old, I see a child that lost all of his words at 13 months and then struggle to regain them, slowly but surely, one at a time. Where some see a child with speech difficulties, I see a child that has fought to learn how to speak all over again. Where some see a child that seems socially inept, I see a child that at one time cuddled and snuggled, shrink back and close himself into his world. I have seen this child fight to make contact with those in "our" world, but not a part of "his" world. To ask to hold the hands of strangers. Where some see a child that seems emotionally inept, I see a child from whom I waited almost 6 years to get my first kiss from, but oh, how sweet his kisses are now when they land on my cheek. Where some see a child still in diapers at the age of 6, I see a child that has struggled with and has started to master something most children conquer before the age of 2. And I don't think I've ever seen a child more excited about this feat. Where some see a child that doesn't seem to understand those around him, I see a child that fights everyday, through limited words and actions, to be understood by those around him. Where some see a child that seems to be oblivious to the things that go on right in front of him, I see a child that sees so much of what goes on that often is overlooked. I see a child that finds the beauty and wonder in the simple things. A child that is in touch with the greater and more important things in life that we often miss. I see a child that wants to be free from his cage. I see a child that fights to be part of something that seems so far from him. I have seen this little soldier fight his way out of the hole, towards the light and into a world that is foreign to him and give his all and more to be a part of a world that he struggles to understand, and a world that so often doesn't make the effort to understand him. The strength to fight, the will to endure the never-ending struggle, the passion for freedom, the courage to relentlessly pursue. These are the true marks of a hero. This is my Zachariah. My hero. At times, one must look down in order to look up to someone. I just realized that I put the wrong end date on my Groovy Give-Away in honor of Zach and Autism Awareness. The end was supposed to be today at 11 am, but for some reason, I was a week ahead of myself and typed the wrote date as NEXT Monday. I was going to go in and change it today, but so many of you have been so awesome with spreading the word out there and forwarding people to my blog to read more about autism and I feel bad cutting it short, so I'm going to leave it open until Thursday of this week (2/21). I want as many people to be able to take part in this give-away and to learn more about autism. Thank you so much for all the wonderful comments, for sending my blog link to others, for posting about it on your own blogs, for helping to spread the word. Knowledge is power and there is power in numbers, as well! The more awareness there is, the more powerful we become to give our kids a brighter future. 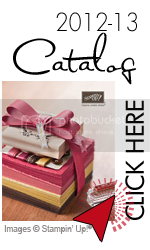 Make sure you pop on over to the Groovy Give-Away Post to enter this fantastic give-away! I have been wanting to use this picture of Zach for a while and I've even known the theme I wanted to use on a page when the time finally came. Today, that time was here. I was able to sit down for about 45 minutes and put a page together. I bought these papers about 2 1/2 years ago and put them aside for a special project. This picture of Zach is one of my favorites and it seemed fitting for special papers. 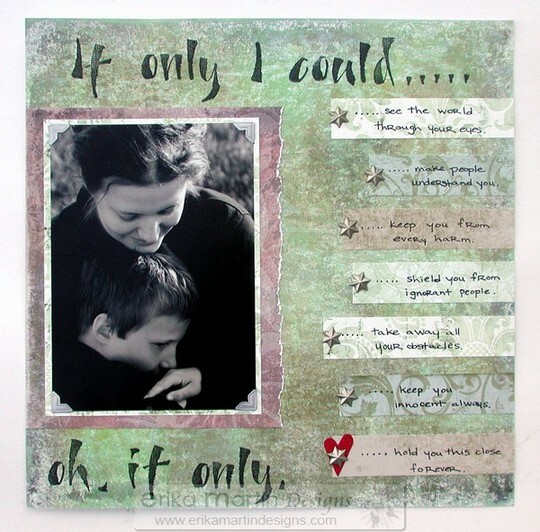 I have a habit, with my scrapbooking, of working on a solid piece of cardstock as the base of my scrapbook page. I then use patterned papers as enhancements to my page. It's rare for me to work directly on an entire 12x12" piece of paper as my main base. I have had many people ask me what Zach's prognosis is as far as his autism is concerned. Many people don't understand when I tell them that we just don't know what Zach's prognosis is. They're confused that he can have a diagnosis but not a prognosis. Welcome to the world of autism. There are many different degrees of autism. That's where the "autism spectrum" term comes into play. As with the varying degrees of that autism spectrum, there's also varying interventions and therapies. Since each child is unique, though, what works for one child may not work for another child. You can have two kids that seem very much the same with their symptoms and may even mirror each other. You can use the same intervention on both of those children and they could work up to a certain point and one child can continue on with progress while the other child seems to "stall" in their progress, or even regress. This is one of the puzzles of autism. We just never know what each day will bring. While I may not have a prognosis to give to people when they ask, I do have wishes and dreams for my Zachy-boy. When there's no prognosis to work with and work towards, dreams and wishes can sometimes be the most powerful things you can have. Those become the things you work towards. The things that give you hope and the things that give you something to hold on to. When hope and wishes are all you have for a prognosis, they turn you into a fighter to make those hopes and wishes into reality. My wishes for Zach are summed up in my quick journaling using label-maker tape at the bottom of my page. They are simple wishes to some, but so important to me for so many reasons. My Wish 4 Me.....That you'll stay with me 4-Ever." As much as I wish and hope so many things for my boy, I have a selfish wish of my own. That he'll stay with me forever. That motherly instinct of mine kicks in on overdrive with that little man of mine. My daughter is so self-assured and overly-confident with herself. I have the feeling she could rule the world single handedly. Zach, on the other hand, I want to shelter like a mother hen. Not that I don't want to shelter my daughter, but she seems content to be able to handle things on her own. I can't see her as being the dependent type when she is old enough to be out on her own. Zach is so dependent on us for so many things and, while I want him to learn independence and be able to live a completely independent and typical adult life, I want to hold him tight and take care of him forever. My wishes and hopes for him are completely different than they are for myself. I'm selfish when it comes to wanting to hold on. I'm sure it won't be easy to let go of either of my kids, but for Zach's sake, I wish and hope for him that the day will come that he will want me to let go. And that he will be completely ready for me to let go. I may not have a prognosis to give people when they ask, but I know what I want that prognosis to be and that's what we work for, strive for and fight for each and every day. I just ask people to be patient with us. We're flying blind, but we're not flying alone. That comforts me and gives me immeasurable hope. 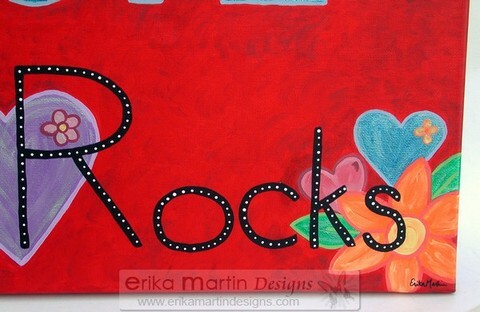 Love Rocks......and love supports autism at the same time! Today, I want to share something very special with you. This is something I've had in the works for a while, but only just recently finished putting the final touches on and have gone "live" with. I did promise to show you how I've combined my passion for autism awareness with my passion for art. That's what my current project is all about. CLICK HERE to find out how to get this great piece of artwork and support Autism Support Daily at the same time! There's a love for painting in my family. My great-grandfather on my maternal grandfather's side was an amazing artist and painter. He spent hours in his basement painting and also painted signs for local businesses. My great-grandfather on my paternal grandmother's side was also an artist and painter. He painted the beautiful landscapes of his country of Germany. I grew up loving anything to do with art supplies. I am most comfortable with a paintbrush or colored pencils in my hand. I always asked for art supplies as a kid......whenever a birthday or Christmas came up, art supplies were at the top of my wish list. I was always drawing and painting. This love has continued into adulthood. My children have inherited this same love and passion for art. My daughter loves the arts. She is just like me when I was a child. Girly (yes, she DOES have a real name - it's Elise - pronounced Ee-LEE-za, which is the German pronunciation and is also my grandmother's name) enjoys sitting at my desk cutting and pasting away. It's amazing that a simple set of watercolors can make her feel like someone has just handed her a treasure chest. In the eyes of a child, and in the eyes of those that still have the heart of a child, a simple set of watercolors IS a treasure chest. Zach also loves to draw and paint. I can't even begin to tell you how much paper we go through in this house. I'm forever finding drawings all over the house. Of bugs, of planes, of dinosaurs, even of the sequence of dreams he has the night before. Many of you may remember the amazing painting Zach created at the bottom of this post ---> HERE. I'm so thrilled that both of my children have inherited both the passion for art, as well as the talent for it. Someone asked me in a blog comment what I liked to paint and my favorite medium. 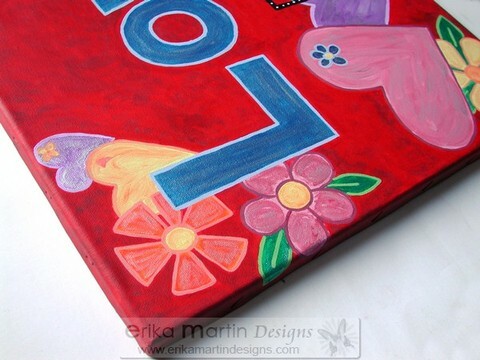 I love to use acrylic paints. Right now, my favorite thing to work on is stretched canvas. And right now, I'm really enjoying working with a whimsical style. As much as I feel connected to this piece of art, I didn't create this to hang in my home, but to hang in someone else's home. I don't know who that person is yet, but I know they're out there somewhere. I'm planning to have a new piece of artwork up on Ebay every week or two, either created by myself, or by my son, Zach, to help to raise both awareness and funds for Autism.